Islamic. Ilkhans, Arghun, AD 1284 to 1291. Silver Dirham. Dated AH 685 (AD 1286). 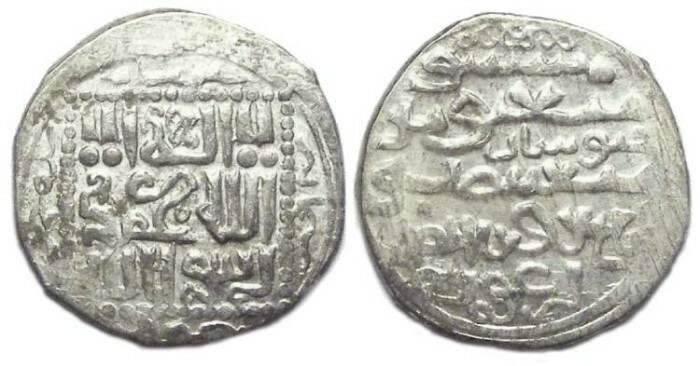 Mint and Mint : Khabusan, AH 685 (AD 1286). Reference : Album-2246, Mitchiner Islamic #1573 to 1574 variety. Size : 18.9 x 19.8 mm. Weight : 2.50 grams. Grade : XF with better than average centering. The scratches towards the edges are from the flan finishing prior to striking.